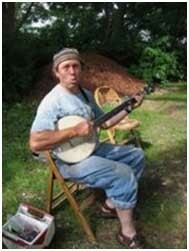 John plays 5-string banjo, guitar, and piano and is the best bottom feeder in the business! When he isn’t smiling and putting on a roof, he is smiling and singing a Woody Guthrie song, accompanied by his wife, Ellen Gawler, or one of his daughters in the Gawler Family Band. Besides doing workshops, John helps host the camper concerts.